You want to know how your stitched project will look. 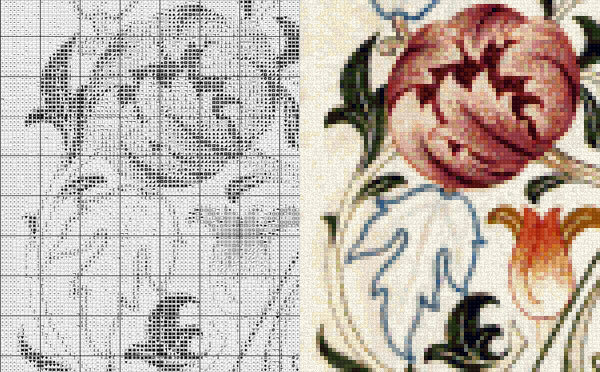 All of our cross stitch images, on our website and the ones on the pattern covers, show finished work, not the painting we started from. You’ll never be disappointed by a result that’s a far cry from the picture you thought you were getting. The pictures are printed on the covers, not stuck in, so they can’t get lost. Our cover material is bright white, heavy glossy paper for durability and vibrant color. Our charts are printed on heavy weight, easy-to-handle 8.5" x 11" pages, coil bound so that the pages turn smoothly and the booklet lies flat. 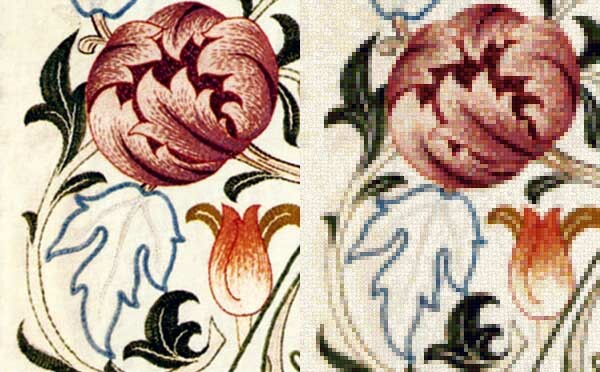 Below, compare a detail in the original art (left) to the corresponding stitched section (right). We use DMC solid colors and blends (one strand each of two colors) in order to increase the beauty and subtlety of your work. We have carefully designed a set of simple chart symbols which are easy to recognize and tell apart. We also minimize the use of similar symbols in a pattern. Since many of our patterns use a lot of colors, the color key is organized by symbol shape to make it quicker to find the symbol you’re looking for. Here you see first circles, then numbers, then letters, then triangles, squares, diamonds, and so on. We include a list of each basic color you’ll need, sorted by color number so you can use it as a shopping list, and the approximate amount of floss you’ll need for each color (for 16-count and 18-count fabric. There is a floss calculator on our web site that will give you the amounts for other thread counts). We give the amounts in units that are practical, so you can quickly get an idea of whether you have enough of a color. The quantities take into account the use of each color alone and in all the blends where it’s used, so you don’t have to add up a lot of separate numbers. Our unique cross reference will save you searching the floss key to see where a color is used. We list each basic color, in numeric order, followed by a list of all the symbols where that color is used. The patterns are printed on heavy, bright-white, acid-free paper for best contrast, opacity, and durability. We use a variety of symbols (not just letters and numbers) so that dark symbols correspond to dark colors in the picture, and light symbols to light colors. The charts are easy to follow because the chart looks like the picture! 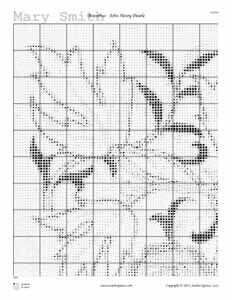 Here is the cross stitch chart section corresponding to the stitched example used above. 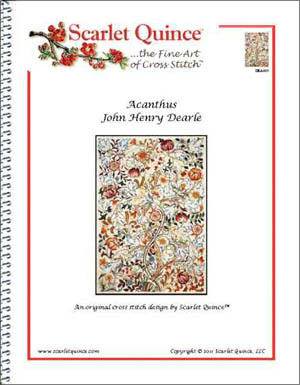 Our patterns are available in two print sizes -- regular or large print! Select the size you want when you add a pattern to the shopping cart. This example compares the same chart section in the actual printed size* of the two sizes. Note that the printed sharpness is over 6 times better than what you see here - the blurriness is due to the screen. Click to see a high-resolution, printable comparison (document opens in new window). * Due to differences in monitors, the image may not be actual size - check the scale. Our unique thumbnail "map" on each page won’t leave you wondering if we are numbering pages across the rows or down the columns. It shows you just where the current page falls in the overall picture. 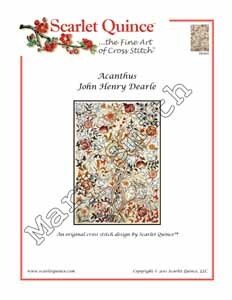 Our electronic patterns have the same features as the printed patterns, except that they are sent to you in PDF format and you print them yourself. Electronic patterns also have a watermark (in the margins of the chart and across the cover) to identify them as yours exclusively. The electronic floss labels have guide lines for cutting them apart.